Josh Boateng named LSC Co-Field Athlete of the Week. 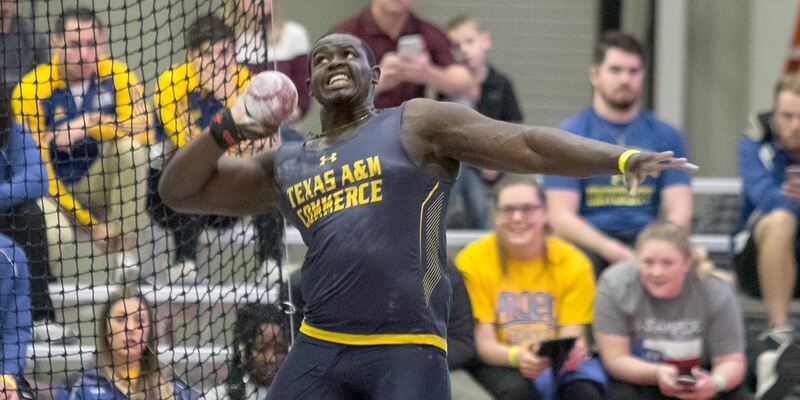 RICHARDSON – Texas A&M University-Commerce junior thrower Josh Boateng has been named the Co-Field Athlete of the Week by the Lone Star Conference, as announced Wednesday. Boateng (St. George’s, Grenada) earned an automatic qualifying mark, provisional qualifying mark, and two event wins in the inaugural East Texas Quad. In the discus, Boateng earned an automatic qualifying mark with the nation’s longest throw this season at 186-1 (56.73m), which also places him in the top 10 this year in all divisions. In the shot put, he launched the shot 57-7.5 (17.56m) for a provisional qualifying mark, the second-best in the LSC this season, and eighth-best in the nation. He split the award with West Texas A&M’s Abraham Seaneke, who was the USTFCCCA National Field Athlete of the Week. Boateng and the Lions compete at the 92nd Clyde Littlefield Texas Relays in Austin this Thursday through Saturday. LOUISVILLE, Ky.– The Texas A&M University-Commerce softball team ranks 12th in the newest National Fastpitch Coaches Association coaches poll. The Lions were ranked 14th in last week’s. The NFCA released the announcement Wednesday. 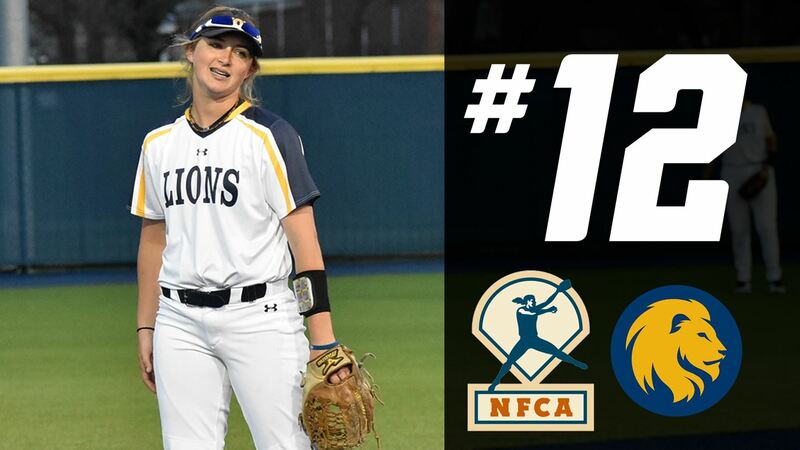 The Lions have been nationally ranked in 20 consecutive NFCA polls dating back to last season. The Lions are on a five-game winning streak. The team swept Western New Mexico over the weekend and also swept a doubleheader against Rogers State on Tuesday. The Lions are currently 27-9 on the season and 13-5 in conference play. They are one of four teams from the Lone Star Conference in the top 25. A&M-Kingsville is ranked 6th followed by West Texas A&M at 9th, A&M-Commerce at 12th and Angelo State at 24th. The No. 12 Lions will face No. 24 Angelo State in a three-game series this weekend. The teams will play in a single game on Friday at 6 p.m. The teams will then meet in a doubleheader on Saturday beginning at 1 p.m. All games will be played at Mayer Field in San Angelo. No. 14 Lions post two stellar defensive performances in a doubleheader sweep of Rogers State. COMMERCE– The No. 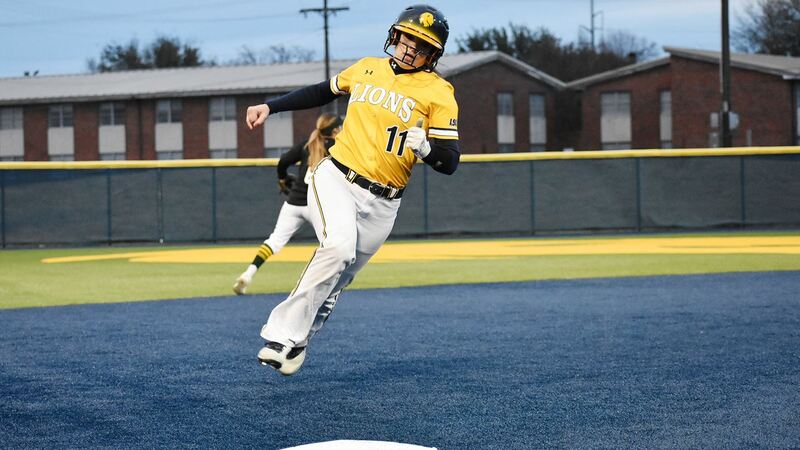 14 Texas A&M University-Commerce softball team picked up a doubleheader sweep of Rogers State on Tuesday afternoon. The Lions won the first game 2-0 and the second game 7-1. The wins bring the Lions to 27-9 on the season while Rogers State falls to 24-12 on the year. The Lions return to Lone Star Conference action on Friday as they travel to San Angelo to face Angelo State. The teams will meet in a single game on Friday at 6:00 p.m. before facing off in a doubleheader starting at 1:00 p.m. on Saturday. All games will be played at Mayer Field in San Angelo. – Emily Otto pitched a complete game, recording her 18th win of the season. She struck out four batters and gave up just four hits in 105 pitches. – Madison Schaefer (Frisco – Independence) hit a solo home run in the second inning. – Jodie Hill (Heavener, Okla.) had a hit and scored a run. Kayla Kilcrease (Kerens) and Bri Sims (Rowlett) also had hits. The game was a pitcher’s duel throughout as both teams turned to their ace. Otto struck out two in the top of the first, and the Lion defense turned a double play in the second as they kept the Hillcats off the board. The Lions then scored in the bottom of the second as Schaefer hit a solo home run over the left field fence. It was the only hit for the Lions early as RSU’s pitcher recorded seven early strikeouts. Otto countered with strikeouts of her own, and the Lions led 1-0 through four complete. RSU had a chance in the fifth inning as a double and two walks loaded the bases. Otto kept her cool and caused a foul out to left to end the inning. The Lions then added to their lead in the sixth. Hill dropped down a bunt for a single and was able to score on a wild throw that ended up in right field. The Lions took a 2-0 lead. Otto and the Lion defense shut RSU down in the seventh to complete the shutout. – Katie Dean (Whitesboro) picked up her eighth win of the year as she pitched a complete game. She struck out six and gave up just three hits. – Jodie Hill had a two-run home run and scored three times in the game. – Kinsie Hebler (Cypress – Cy Fair) had a single and scored two runs. Vanessa Avina (Haltom City) had two steals and scored a run. Da’Jia Davis (Hillsboro – Midway) also scored a run. – Kimber Neal (Humble – Atascocita) and Bri Sims both had RBIs. – Chealsea Slider (Texarkana – Texas HS) had two singles. The Hillcats recorded a hit on the first pitch of the game but were then held hitless through the next four innings as the Lions built a lead. Hebler reached on a single and Hill reached on an error, and both scored as an errant throw brought both runners home. The Lions led 2-0 after one. Dean struck out three in a row in the second inning, and the Lions then added to their lead. Hill hit a two-run homer to double the Lions’ lead. The Lions again added two runs in the third inning. Avina stole both second and third after pinch running and a bad through brought her home. With the bases loaded, Neal then drew a walk and a run scored. The Lions led 6-0 after three. The Lions scored another run in the fourth inning as Sims hit a sacrifice fly to score Hill. RSU hit a home run in the sixth inning to produce their lone run, but the Lion defense continued to suffocate the Hillcat offense and the Lions left with the 7-1 win. Rock Light joins Lion Track & Field as the assistant coach. 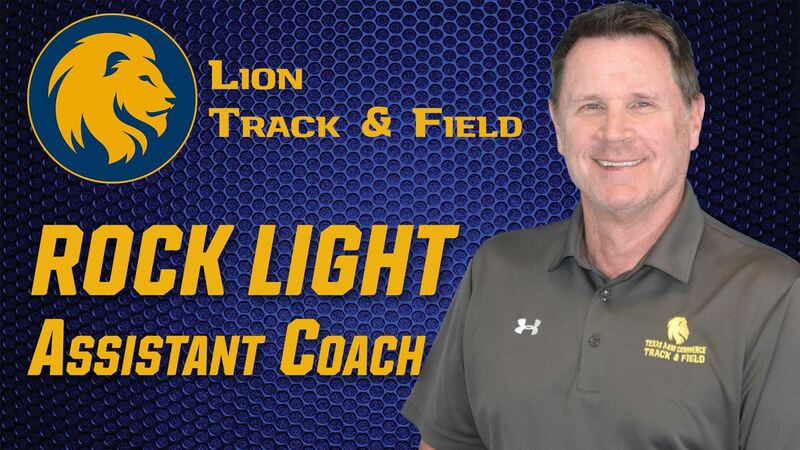 COMMERCE – Texas A&M University-Commerce head track and field coach George Pincock has announced the hiring of Rock Light as the assistant coach for the Lions. “We’re extremely blessed to have coach Light on staff with us. He brings a tremendous background in all event areas. He’s worked with some of the best athletes in the world, and I know our student-athletes will improve under his guidance and his tutelage,” Pincock said. “It was an honor to receive the phone call from coach Pincock to ask of my interest to return to coaching after a year and a half of retirement. I realized how much I missed coaching, and once I met with (director of athletics) Tim McMurray, the student-athletes, and the staff, I knew this was going to be my next stop in my coaching career. It’s great to be back in the Lone Star Conference, working with a program that has had a great history,” Light noted. A highly-regarded coach at the collegiate, U.S. and international levels for more than three decades, Light has coached four Olympic Qualifiers, including Charles Austin, who set the world record and won Olympic gold in the high jump in 1996. He has coached a national champion in each event he is responsible for coaching at A&M-Commerce, and school records still stand at each of his coaching stops. Light was most recently the head track & field coach at his alma mater – Adams State – for four years, earning five Division II Program of the Year honors from the USTFCCCA (four men, one women), 10 top 10 team finishes, 11 RMAC team championships, 192 Division II All-Americans, and seven RMAC Coach of the Year honors. The Grizzlies won three NCAA Division II National Championships in Light’s second tenure at ASU – 2014 women’s indoor, 2015 men’s indoor, and 2016 women’s indoor. He was inducted to the Adams State Hall of Fame in 2017 and the RMAC Hall of Fame in 2008. Light has served as a consultant for the US Olympic Training Center and was the associate head coach at Texas Tech from 2005-12. At Tech, he coached First Team All-Americans in seven events and Big 12 champions in four games. He coached a Big 12 MVP, a Big 12 High Point Award winner, two Big 12 Athletes of the Year, and three Big 12 Freshmen of the Year. He also recruited two classes which were ranked in the top five in the nation by Track & Field News. Before his time in Lubbock, Light was an assistant coach at Oregon, where he was named the 2005 PAC 10 Men’s Co-Coach of the Year as he coached student-athletes to seven new school records. He coached two NCAA All-Americans, co-coached one NCAA National Champion, instructed 13 top five all-time indoor performances and 17 top 10 all-time outdoor performances. Before his time in Eugene, Light had great success at LSU as the team’s recruiting coordinator and mentor for their heralded men’s and women’s multi-event, high jump, and men’s hurdle student-athletes. As an assistant coach for six seasons from 1989-95, his athletes claimed four NCAA titles (men’s and women’s high jump, heptathlon and decathlon), 15 All-America performances, 13 SEC titles, and 12 school records. Indoors and outdoors during that run, the LSU men and women combined for 11 NCAA team titles, eight SEC titles and 19 top-10 NCAA team finishes. In that stretch, he also coached post-collegian Charles Austin, 1996 Olympic gold medalist, 1991 World Championships gold medalist, and Olympic record holder. In his previous coaching position, he served as men’s and women’s head track and field and cross country coach at Southwest Texas State in San Marcos from 1983-89. He guided SWT to a pair of Southland Conference titles (and six runner-up finishes) to go along with five Gulf Star Conference crowns. Individually, his athletes won seven combined league titles and 21 All-America honors. In return, he was named 1989 NCAA District VI Coach of the Year, and overall was a seven-time Southland and Gulf Star Conference Coach of the Year honoree. Light began his coaching career as the women’s track and field and cross country head coach at Adams State College for two seasons from 1980-82. He was honored as NAIA National Coach of the Year following his team’s NAIA cross country win in 1981 (and then-meet record low 25 points), and an outdoor national runner-up finish in 1982. Individually, his athletes claimed four individual track and field and cross country crowns, two NAIA National records, and 15 All-America plaques. As a student-athlete, he was a two-time All-America sprinter at Adams State, and graduated with a bachelor’s degree in health, physical education and recreation in 1979, and added a master’s degree in exercise physiology in 1980. A native of Lamar, Colo., Light and his wife Shanny have two sons, Tyler and Brett. 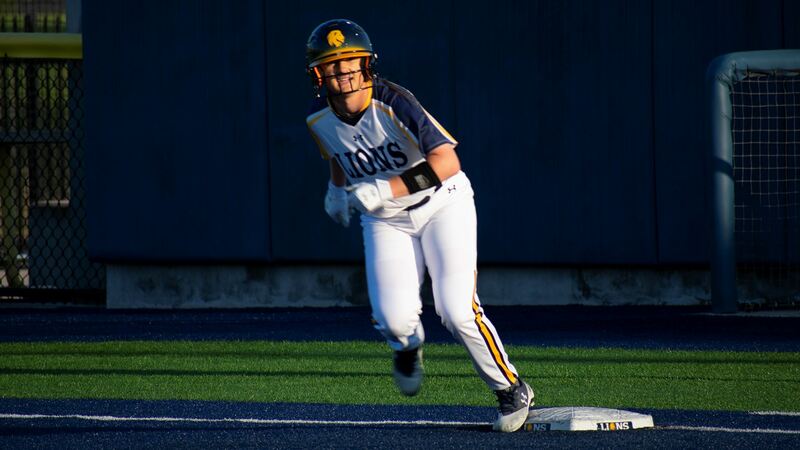 RICHARDSON– Texas A&M University-Commerce softball player Kimber Neal has been named the Lone Star Conference Hitter of the Week. The conference office announced the news on Tuesday. Neal is the second Lion to win the award this season. Neal had a weekend to remember, hitting .800 with four homers against Western New Mexico. The sophomore from Humble (Atascocita HS) hit a grand slam, two three-run homers, and a solo homer, tallying 11 RBIs for the week with a 3.200 slugging percentage. She had an on-base percentage of .900, also drawing three walks and two hit by pitches. In the first game, Neal scored two runs and had four RBIs on a solo homer and a three-run homer, while also drawing a walk. In game two, she did even more damage, smashing her first career grand slam and also had another three-run homer. She also had one walk and scored three runs. In the final game of the series, Neal drew a walk and scored a run. In all, she reached base in nine of her 10 plate appearances and scored six times. Neal and the No. 14 Lions are in action today as they host Rogers State. The teams will play a doubleheader beginning at 4:00 p.m. Tickets to the series are available by visiting WeAreLionsTix.com, calling Lion Sales & Service at (903) 468-8756, visiting the LSS Box Office in the Field House during business hours or by purchase at the gates of the John Cain Family Softball Field.